Now that the snow has finally melted and spring is here RENEW Wisconsin is ramping up its activities around the state of Wisconsin. 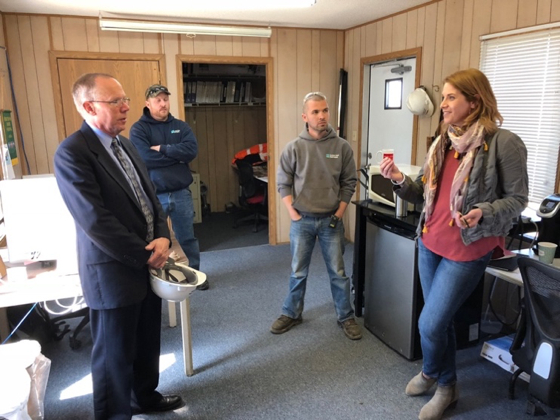 This last week was especially busy for me as I visited central and western Wisconsin to learn about renewable energy across the state and to meet and talk about the trends in renewable energy with our elected officials. 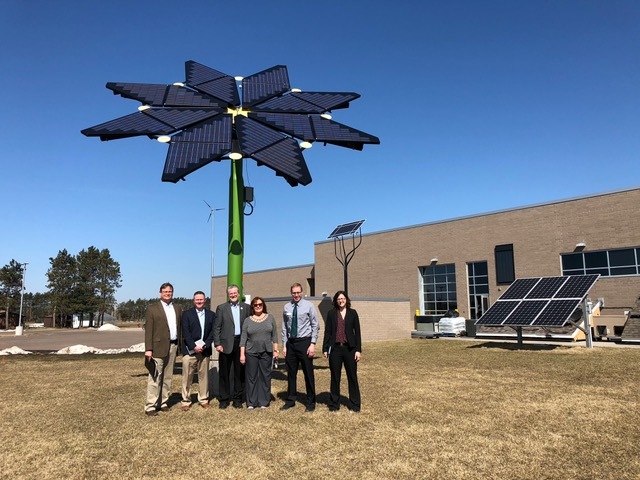 On Sunday, April 22nd, the Democratic Party of Portage County celebrated Earth Day 2018 by holding a ribbon cutting event for the brand new solar array that they installed on their headquarters building in Stevens Point, Wisconsin. The event was moderated by State Representative Katrina Shankland and more than 40 people were in attendance. This was the first solar array on any Democratic Party office in the State of Wisconsin. They are betting there will be plenty more very soon! RENEW member Doug Stingle of North Wind Renewable Energy installed the system. 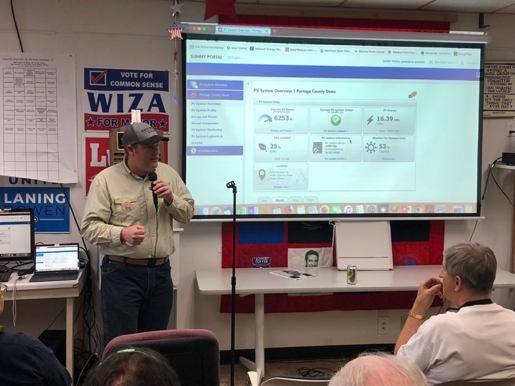 Doug explained some of the technology behind the 7.4 kW array and showed how it will offset an anticipated 67% of the Democratic Party office’s annual electrical usage. To close the event, Rep. Shankland introduced me and asked me to give an update on what RENEW Wisconsin is working on to advance renewable energy in the state. 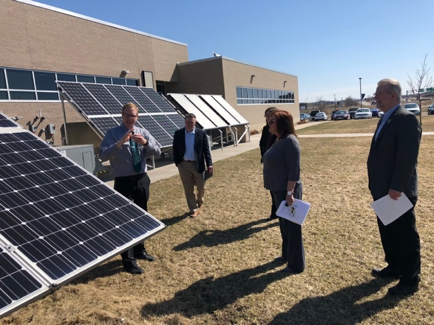 On Monday, April 23rd I was very excited to visit the Chippewa Valley Technical College (CVTC) and their Energy Education Center and get an interesting tour of the facility by Adam Wehling, Dean of the Agriculture, Energy and Transportation Department. Joining me on the tour were Deb Erwin of Xcel Energy and three local state legislators from the Eau Claire area; Representatives Kathy Bernier (Lake Hallie), Warren Petryk (Eleva) and Rob Summerfield (Bloomer). The Energy Education Center offers diverse training in various energy generation, energy distribution and energy efficiency technologies. The renewable energy certificate is integrated into their other trades programs such as Electrical Power Distribution, and HVAC Technician. All three legislators were very interested to hear about the tremendous reduction we are seeing in price of wind and solar energy and fast growth that those technologies will see in Wisconsin in the near future and working together to address the challenges and opportunities that these emerging technologies will present. On April 23rd and 24th I continued my North-West Wisconsin renewable energy tour in Eau Claire and participated in a local government summit hosted by the Wisconsin Academy of Sciences, Arts & Letters titled “Leading the Charge” that explored emerging issues in local energy planning and resilience in Wisconsin communities. Speakers from across the state discussed their local efforts to increase energy efficiency and how local governments can use renewable energy and efficiency to reduce emissions and increase energy resiliency. Other sessions discussed solar energy financing programs for private businesses, residences and local governments, the future trends in energy usage such as electric vehicles and the jobs and training necessary to grow the renewable energy industry in Wisconsin. On April 24th, following the Local Government Summit, I stopped in to see Wisconsin’s newest State Senator Patty Schachtner (Somerset) to introduce myself and to talk about some of the issues facing renewable energy in the next few years. Senator Schachtner drew national attention when she won a special election in the 10th State Senate district to replace Senator Sheila Harsdorf who retired from the seat in December to assume the position of Secretary of the Wisconsin Department of Agriculture, Trade, and Consumer Protection. 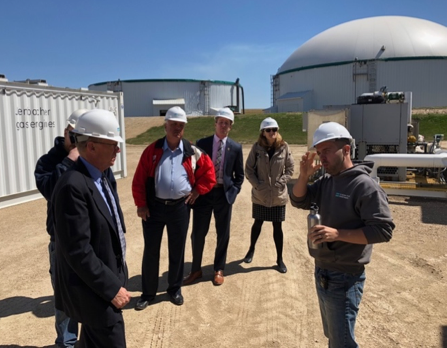 On Wednesday, April 25th I joined RENEW Wisconsin member Jessica Niekrasz of Clean Fuel Partners for a tour of their biodigester facility located just north and west of Madison. On the tour was General Donald Hoffman, a retired four-star general of the United States Air Force who is doing research on the fast-developing world of renewable energy technologies and how they can make our nation more secure. Also joining the tour was Jon Plumer, who is a member of the Lodi Town Board and is running for election in the 42nd Assembly District which is also located just north of Madison. The City of Ashland, Wisconsin is seeking competitive design proposals from local artists for an art installation in H. Pearson Plaza, behind City Hall. According to the city’s RFP, the main goal of this installation will be to incorporate solar panels to provide an educational opportunity as well as to further beautify the park area. Energy created from the solar panels will be monitored and described on a plaque adjacent to the installation. H. Pearson Plaza has approximately 7,000 square feet of area to work with, is centrally located off Main Street, and visible on US Highway 2. This project will demonstrate the dedication of the City of Ashland to sustainability, as well as further distinguish the city as artistic and unique. The City of Ashland Planning and Development Department is looking to expand the City’s vision as a sustainable city of the future. As one piece in multiple initiatives to expand the sustainability infrastructure, the City would like to commission a local artist to design and install a sculpture incorporating solar panels. This piece would serve as a demonstration of solar technology as well as further beautify the newly redesigned park. 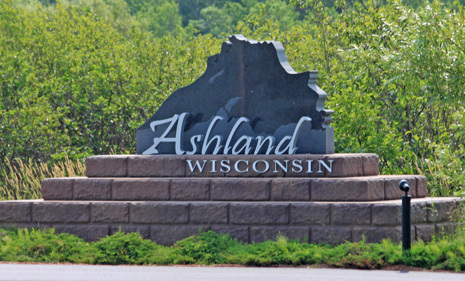 The City of Ashland, Wisconsin will be receiving proposals for the above noted project until Friday, June 1, 2018. For more information and to submit, please see the City of Ashland’s RFP. In the spirit of leading by example, Dane County launched two separate and distinct initiatives this week to power its own operations with clean energy resources. One initiative involves becoming a co-investor in solar and wind projects that will supply Dane County offices with zero-emission electricity. The County will issue a Request for Proposals in early May. The other project, with an estimated price tag of $25 million, will clean up the methane coming from the Yahara landfill and several local dairy farms and convert it into compressed methane fuel for the County’s vehicle fleet. RENEW member businesses BioFerm and Clean Fuel Partners are part of the team of contractors developing this project. Construction of the project will commence this spring, and should wrap up in the first half of 2019. County Executive Joe Parisi circulated an email summarizing the renewable energy initiatives detailed below. As we approach Earth Day this weekend, it is my pleasure to share with you exciting news of two projects that continue to make Dane County a leader in renewable energy in Wisconsin. This week I announced that Dane County will seek partners in the coming weeks to help develop new solar and wind farms across Wisconsin. It’s our latest investment in clean, renewable energy in an effort to improve efficiency and reduce climate change causing emissions. The county will release a request for proposals, seeking offers from prospective solar and wind developers on projects Dane County could become an investor in. Projects will be evaluated this summer, with recommendations made in time for 2019 budget preparations. The goal is to facilitate the development of projects that generate renewable electricity to offset the amount of energy used to run county operations. In turn, keeping with the county’s benchmark of being 100% sustainable. And yesterday, I helped kick off construction for an innovative project that will turn garbage and cow manure into renewable fuel for thousands of vehicles across the region and country. This project is also expected to significantly increase our lakes clean-up efforts by increasing revenue opportunities for local biogas digesters. Taking cow manure and garbage and turning it into vehicle fuel is good for the air we breathe, the waters we fish and swim in, and county taxpayers. We are committed to accelerating work to clean up our lakes and financing efforts to produce renewable energy, and this project does both. Design work of the new facility is complete and the remainder of the project is out for bid now. Construction is expected to begin in the coming weeks with the system online by spring of 2019. This project is the first in the nation to be able to receive biogas from multiple off-site locations and connect that renewable gas with CNG gas stations locally and across the nation. County Executive Joe Parisi announced today that Dane County will seek partners in the coming weeks to help develop new solar and wind farms across Wisconsin. It’s the latest investment in clean, renewable energy by the County Executive who’s prioritized installing solar at county facilities, most recently making up to 40 acres of land at the Dane County Regional Airport available for solar, all in an effort to improve efficiency and reduce climate change causing emissions. In the coming days, the county will release what’s called a request for proposals, seeking offers from prospective solar and wind developers on projects Dane County could become an investor in. Projects will be evaluated this summer, with recommendations made in time for 2019 budget preparations. The goal is to facilitate the development of projects that generate renewable electricity to offset the amount of energy used to run county operations. In turn, keeping with the county’s benchmark of being 100% sustainable. Dane County currently owns more solar than any other public entity in the state with nearly 600 kW at 15 sites across the county, not including the upcoming Airport Project which will be the largest public sector project in Wisconsin. That project could generate over 8 megawatts of power, almost three times more than the largest solar project currently operating in the region, a 2.25 megawatt facility in Beloit. In addition to the airport, Parisi’s budgets have funded solar projects at the Dane County Job Center, the new East District Highway Facility and Medical Examiner’s Complex, the offices of Dane County Land and Water Resources, the Dane County Library Service and others. Additional future solar projects are planned for the Alliant Energy Center. The new solar projects will reduce carbon dioxide emissions by the equivalent of taking 1700 cars off the road, reducing direct energy costs by over $2.1 million over the next two decades. The new Dane County East District Highway Garage that opened last year has well over 800 solar panels and is the second largest municipally-owned solar project in the state. In addition to the solar developers, the project will employ local electricians and construction workers. There are more than 2,800 people employed in the solar industry in Wisconsin and 460 in Dane County, according to the Solar Foundation, which tracks solar jobs nationwide. Dane County is second only to Milwaukee County in the number of solar jobs in Wisconsin. Expanding the county’s investment in solar projects will help continue the county’s tradition of being 100% sustainable. For more than the past two decades, Dane County has generated renewable electricity at its landfill, fueled by the naturally occurring methane given off by the waste. Presently, the landfill makes enough electricity to power 4,500 homes. The county has initiated an innovative project to instead convert this methane into clean burning vehicle fuel, to further reduce carbon emissions by thousands of tons, the primary contributor to climate change causing greenhouse gases. In addition to helping Dane County achieve nearly 100% renewable status, the two landfills since 1998 have earned over $35 million for taxpayers thru the sale of renewable electricity. The County’s total renewable power generation reduces CO2 emissions the equivalent of taking over 5,200 cars off the road. 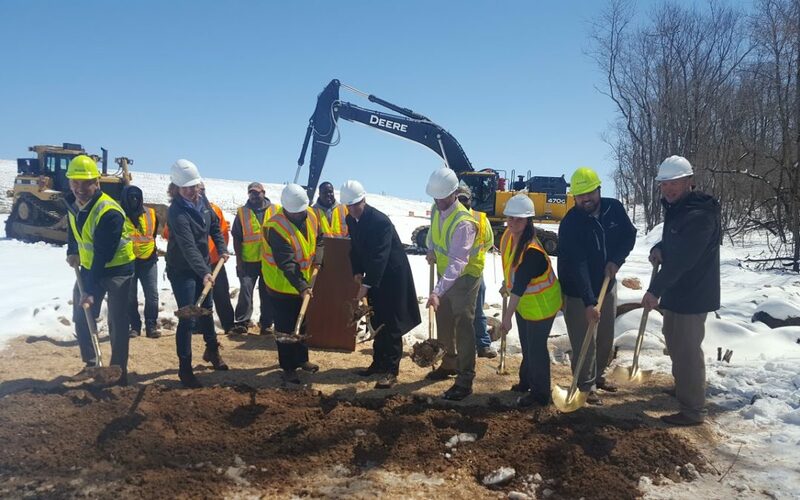 Today, Dane County Executive Joe Parisi kicked off construction for an innovative project that will turn garbage and cow manure into renewable fuel for thousands of vehicles across the region and country. This project is also expected to significantly increase our lakes clean-up efforts by increasing revenue opportunities for local biogas digesters. Design work of the new facility is complete, BIOFerm has started ordering its system components, and the remainder of the project is out for bid now. Construction is expected to begin in the coming weeks with the system online by spring of 2019. 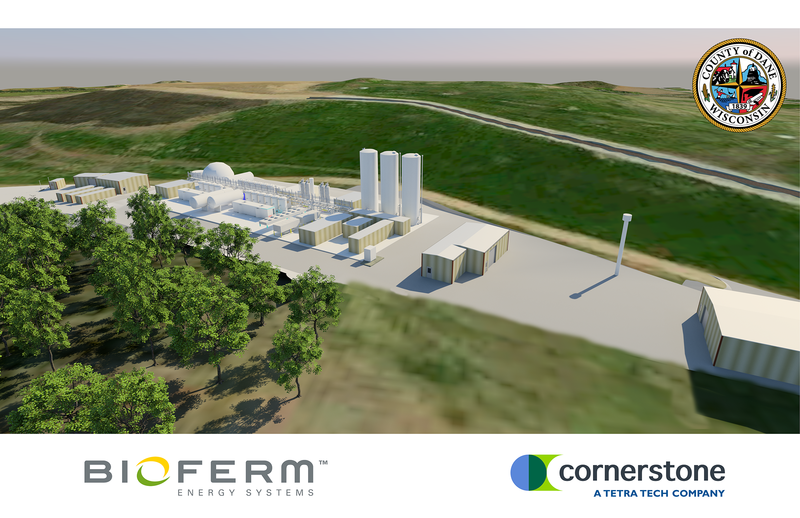 Dane County announced this today at a press conference with project partners Cornerstone Engineering, Clean Fuel Partners and Bioferm Energy, who is designing and supplying the biogas cleaning system for the project. The Dane County landfill currently generates electricity with the gas collected from the breakdown of garbage and organic material. Presently, the landfill makes enough electricity to power 4,500 homes. This new facility will enable the County to convert its landfill gas into vehicle fuel, thereby eliminating thousands of tons of carbon emissions, a leading cause to the extreme weather events triggered by climate change. In addition to the project’s environmental benefits, it is estimated the county will generate enough revenue from the project to payback its $25 million cost of the project in just a few years. That creates economic opportunity for both Dane County taxpayers and owners of “Cow Power” facilities north of Lake Mendota to convert their operations to gas production. The County’s 2018 budget included the final phase of funding totaling $23.5 million for Dane County to build a biogas processing facility at its landfill and connect it with an adjacent interstate pipeline. That facility will clean up all of the collected landfill gas and turn it into renewable vehicle fuel. Of the total $23.5 million cost, $5.5 million is new funds in the 2018 budget. Those additional funds will allow the county to build a gas off-loading station where other biogas producers, like dairy digesters located in the North Mendota watershed, can bring their cleaned up fuel and have it injected into the pipeline. The gas would first need to be purified and compressed by the owner’s equipment before being hauled to the landfill for injection into the interstate pipeline. This Dane County project is the first in the nation to be able to receive biogas from multiple off-site locations and connect that renewable gas with CNG gas stations locally and across the nation. The 2018 county budget also included a $200,000 study to look into where additional digesters could be located to process manure into biogas. This will keep more manure off the land, reducing phosphorus on fields prone to runoff during heavy rain events that can get into waterways and cause algae blooms. Digesters reduce greenhouse gas emissions by collecting and destroying methane that would otherwise be emitted to the atmosphere. They also help farms manage manure more responsibly, which reduces harmful runoff to lakes and streams. The county’s new facility at the landfill will make it economically feasible for manure digesters in the county to continue to produce renewable energy, reduce greenhouse gas emissions, and clean up our lakes.